Oxygen comes in at least three classifications. The most common classification is medical grade oxygen, which requires a doctors prescription. Medical grade oxygen is usually 95 to 100 percent oxygen. The second most used classification is Industrial grade oxygen used in welding, jewelry making and airlines, and is probably about 95% oxygen. The third most used classification is called recreational oxygen and can range form 20% to 95% oxygen while the balance is nitrogen. Normal atmospheric air at sea level is 21 percent oxygen, 78 percent nitrogen, and 1 percent miscellaneous gasses. Sports oxygen, SportsOxygen.com, is recreational oxygen, usually 85 percent to 95 percent oxygen, and is used to increase stamina and endurance during sports activities. Studies show that oxygen is responsible for up to 90 percent of your body’s energy production. Used before competing it will provide one with a longer period before fatigue sets in. Used during competing, it will almost immediately restore ones energy. Used after competing, it will eliminate the fatigue is about 2 or 3 minutes. One time we were serving oxygen from our oxygen bar at a motor cross race that was 6 laps starting in Lake Elsinore going out into the country side and back through Lake Elsinore. Normally riders become fatigued after 3 laps and just hang on to finish the race. Usually after three laps the race is a parade with little passing of riders. After one race on Saturday a Mr. Snodgrass came by our oxygen bar to get oxygen so he would have the energy to ride back to his camp. He was totally exhausted and a ball of sweat. After his oxygen session, he felt much better. He said he had taken 3rd place in his race but his big race was Sunday. On Sunday morning Mr. Snodgrass came back before his race and brought 6 friends with him to get oxygen before racing. Mr. Snodgrass was competing against tougher competition and took first place in his race. He had hardly broken out in a sweat after the race. His buddy was in a different class and led the race from the start until the third lap when he fell off his bike and down a 20 ft embankment. It took a while to climb back up to his bike and start racing again. 4 riders had passed him during this time and he took off after them, passing all 4 riders and taking 1st place. These 4 riders were too exhausted to ride aggressively and were easy to pass. They did not have oxygen before the race. A third buddy of Mr. Snodgrass was competing in his first motor cross race, against other beginners, and he took 1st place. The other 3 friends of Mr. Snodgrass all reported finishing much better than they had ever finished before and credited the oxygen bar for their success. 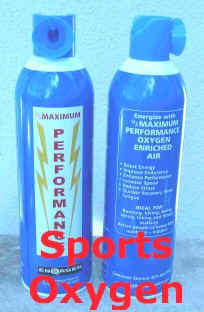 Sports oxygen, or oxygen in a can, is now available from several online sources. It is so new, that most retailers are not aware of it and do not carry it in their stores yet. There is an effort to develop a marketing network to promote oxygen. Sports oxygen can be beneficial in almost any sport. It not only increases stamina and endurance, it also improves memory and alertness levels so one can benefit from making better decisions while competing, or taking an exam. Sports oxygen is also used for high altitude sickness. headaches, hangovers, stress, jet lag, cramps, and minor aches and pains can all benefit from oxygen. Currently the largest market for oxygen in a can is Colorado because of its high altitude at ski resorts. Oxygen is also noted for flushing cancer causing toxins from ones blood, however it does not sound likely one can benefit from the limited amount of oxygen in a can. A more intensive oxygen session like that found at an oxygen bar is probably required to flush toxins and impurities sometimes called “free radicals” out of one’s blood. When one is 10 years old, their blood carries 99 or 100 percent of the of the oxygen that can be carried in blood. As we age, and are exposed to smog, cigarette smoke, and other toxins, ones oxygen level drops to 96 percent or 94 percent. Once the oxygen level drops to 86 percent, one is probably on oxygen full time. Breathing oxygen enriched air, or recreational oxygen called sports oxygen, the oxygen level in ones blood increases until maximum oxygen content is achieved at 99 percent plus. While recreational sports oxygen may claim a lot of benefits, which are based upon science or research, it is not intended to cure, treat, mitigate or prevent serious illnesses. Do not replace or mimic the activity, effects or benefits of drugs or medications. Do not substitute or replace your medication(s) with recreational oxygen. When in doubt, consult your doctor. If pregnant, it is also recommended to consult your doctor before using recreational or sports oxygen.